When I make my fortune, I am going to buy a luxurious studio apartment in either South Yarra or Southbank and live the high life. The apartment will have 5 star hotel-worthy facilities, million dollar views, and be within walking distance of dozens of good places to eat. 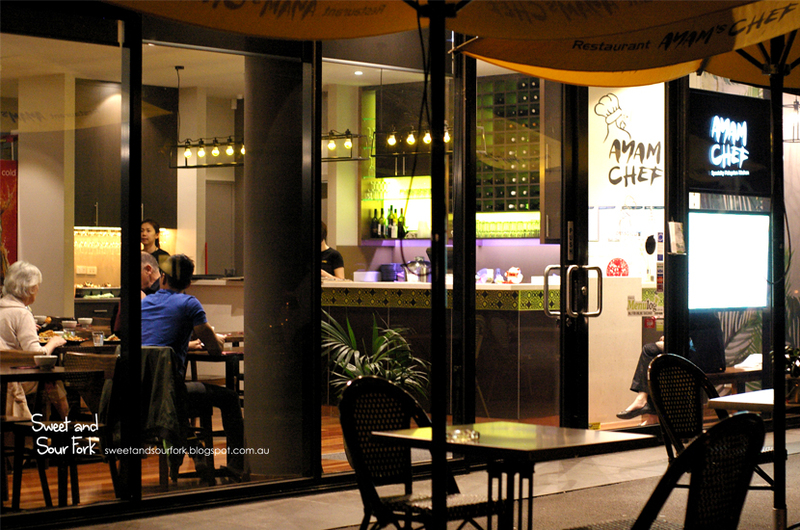 In the meantime, I’ll just settle for sleuthing out nice restaurants, and Ayam Chef makes a good point for Southbank. 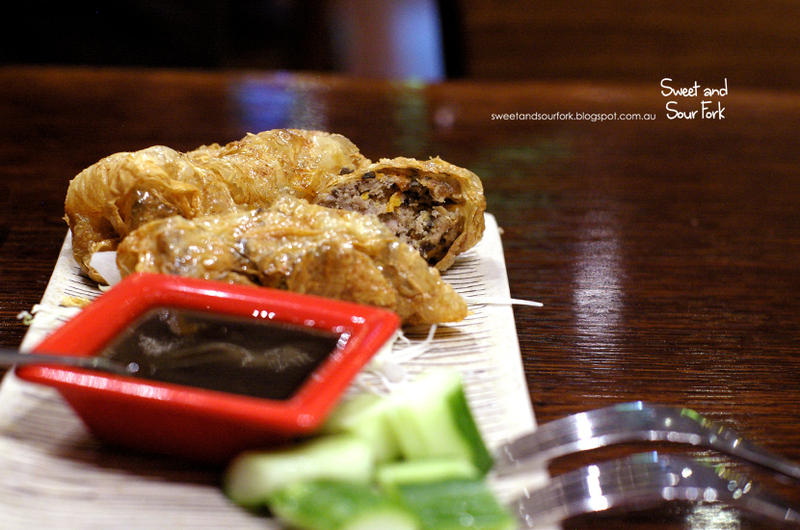 When I think about Southbank, Malaysian food does not tend to follow. After all, what does the folksy street food of South East Asia have to do with an illustrious suburb in Melbourne? 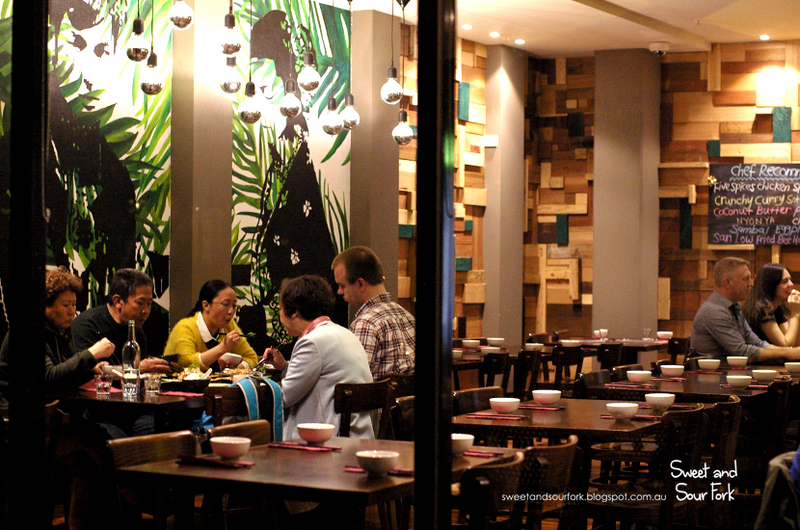 As it turns out, Ayam Chef fits right in with its bright and modern interior, fitted out with lots of sleek dark tables and a tropically-influenced mural. Though it’s a bit canteen-like, it doesn’t feel tacky at all, and is really rather welcoming. Like most Asian restaurants, the menu is designed to share. 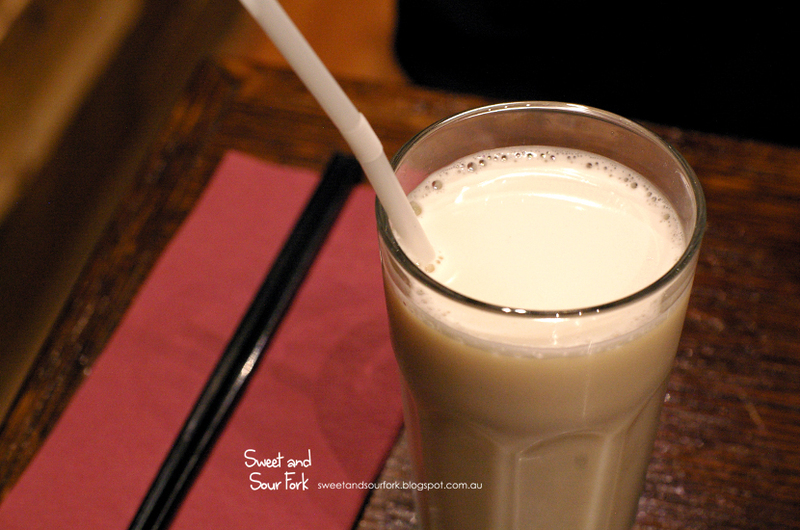 Whilst I browsed through my choices, I sipped on a tall, sweet glass of Soy Milk ($2.8). In the end, I asked our waitress to give me a hand, and she suggested that we try the Crunchy School Prawns and Chives Pancakes ($6, 2pcs). This dish gave a fantastically refined twist to the greasy chive pancakes of my childhood. Light and golden, they were embedded with crunchy school prawns, and absolutely mouth-watering when dipped into the sauce of lime and fresh red chillies. Similarly delicious was our snack of Lobak ($8, 2pcs). Ensconced in the brittle parchment of fried tofu skin was a moist filling of minced pork. It was warmly seasoned with the unmistakable aroma of 5-spice powder, and the addition of finely chopped black fungus gave it an addictive element of crunch. Have it with or without the plum sauce – it’s all good. 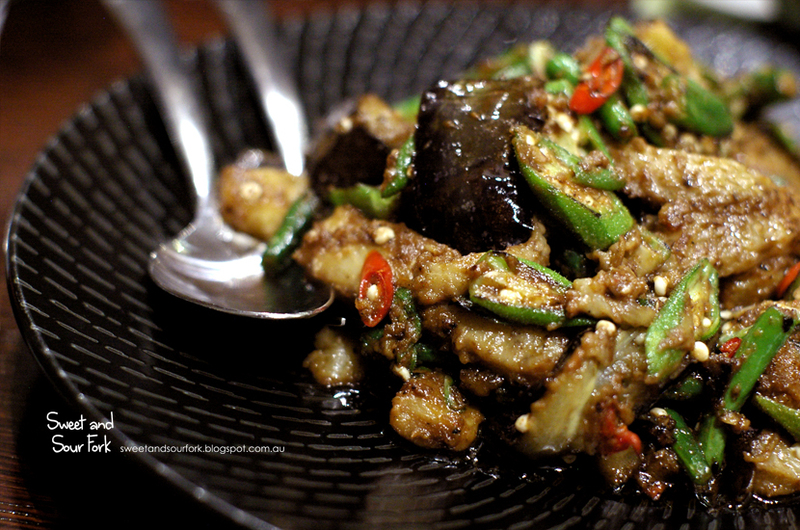 One look at the Sambal Eggplant ($17) and I knew it was going to be bursting with flavour. The plump strips of eggplant glistened with oil, and each piece was infused with the briny, exotic flavour of sambal – chilli, fried shallots, and shrimp. 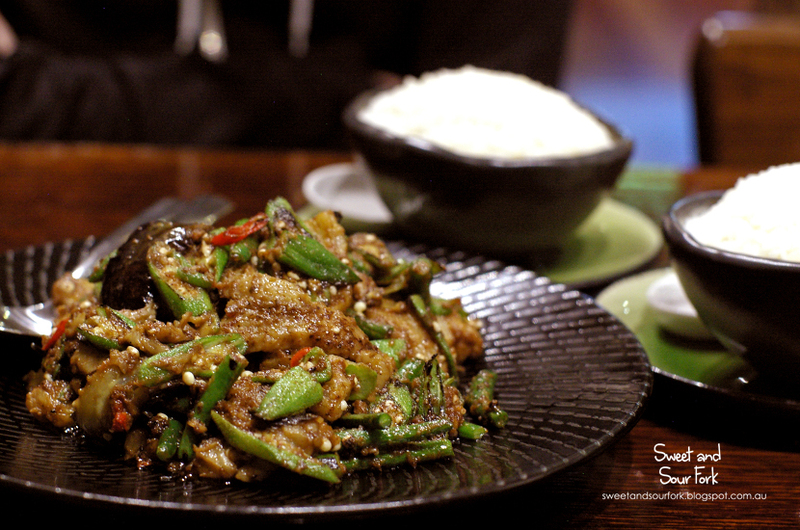 For a little variance on the texture, the eggplant was stir-fried with slippery pieces of okra, and beans that still had their crunch. It was a quintessentially Malaysian dish that was perfect with rice. 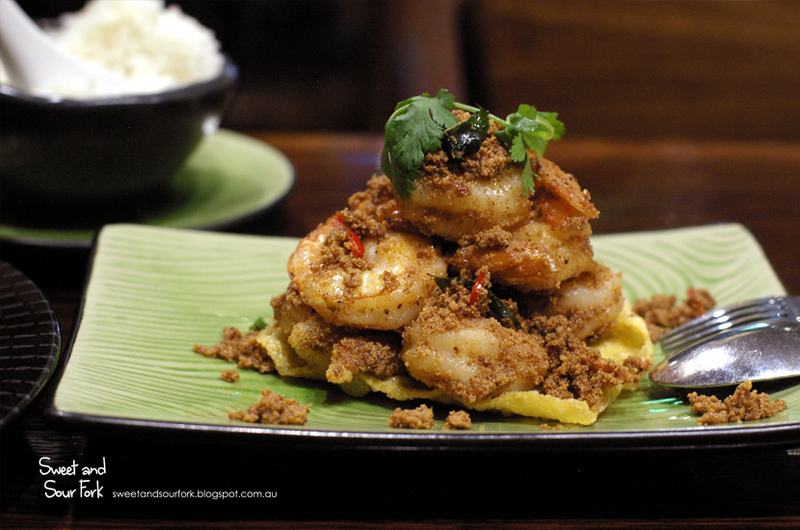 The Coconut Butter Prawns ($22) was a more modern take on Malaysian cuisine. The massive prawns were quickly pan-fried before being coated with an aromatic buttered coconut crumb. 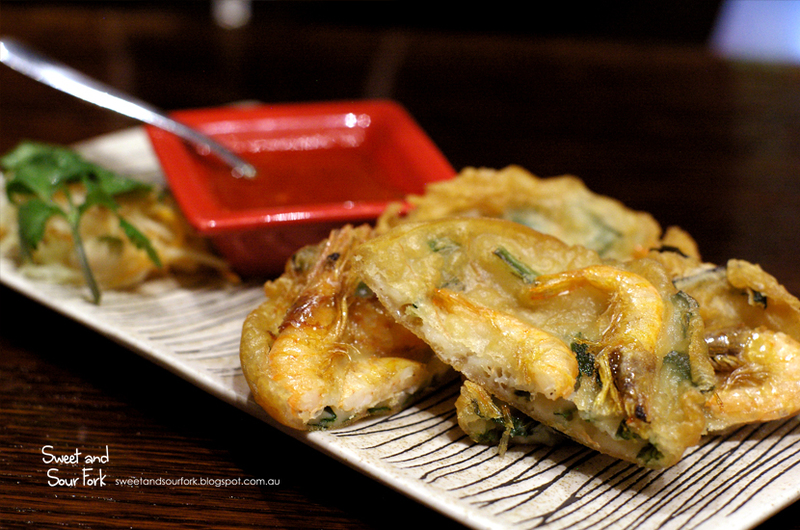 The texture of the prawns was astounding; it was bouncy and succulent, and the freshness was exquisite. Though the serving had initially seemed small, the richness actually meant that I needed way less than I had expected. Now that Chris has decided that he does like coconut after all, we have a much easier time choosing dessert at Asian restaurants. The Kueh Dada ($7.5) was presented beautifully, the jade-green crepes wrapped around shredded coconut soaked in palm sugar. On the side were scoops of coconut ice cream, which was studded with pieces of frozen coconut and finished with a drizzle of chocolate. I felt that this dish suffered from an identity crisis, as it couldn’t decide if it wanted to be Asian or Western. However it tasted good enough, and looked lovely enough, that I couldn’t really bring myself to care. My meal at Ayam Chef brought to mind one of the most delicious meals I had in Malaysia at a local seafood restaurant. 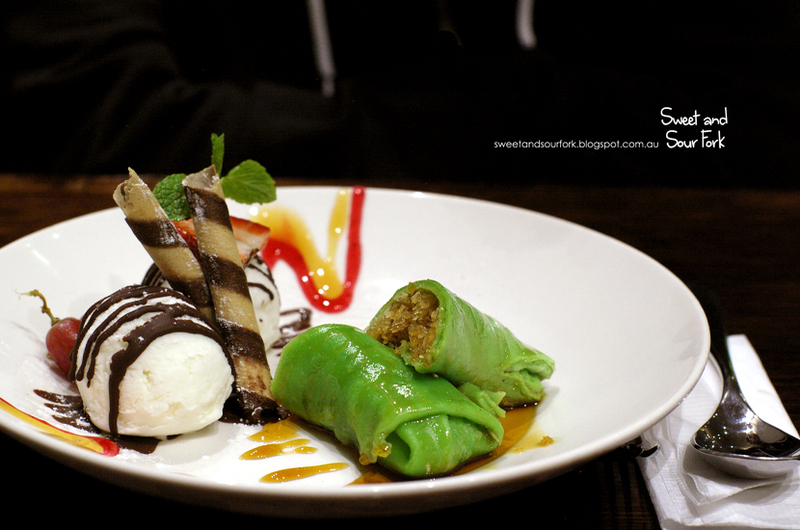 It is quite a few steps up from the hawker-styled dishes you’re likely to find at the Malaysian restaurants around Melbourne, and showcases the flavours Malaysia has to offer beyond noodles and rice. Though the portions are slightly on the small side, it is definitely worth a visit if you’re in the area. Rating: 13.5/20 – classy malaysia. Sweet and Sour Fork dined as a guest of Ayam Chef.